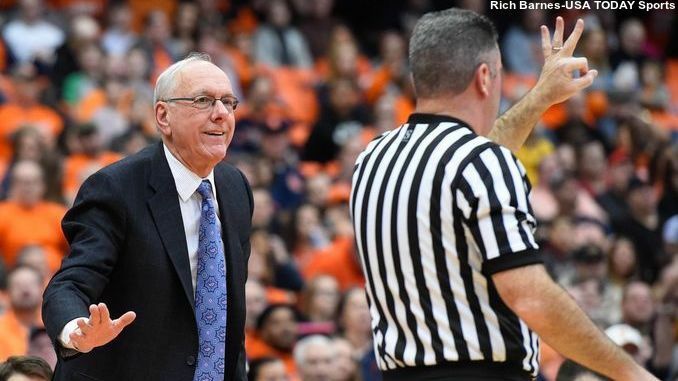 Jim Boeheim speaks to a referee during the first half of Syracuse's game. Mandatory Photo Credit: Rich Barnes-USA TODAY Sports. Syracuse’s typically dominant defense struggled on Wednesday in a 74-70 loss to NC State, one with potentially damaging repercussions come March. Entering the game, Syracuse had the second-best defense in the ACC, allowing under 63 points per game. Meanwhile, NC State’s offense was ranked within the top five in the conference, averaging 80.9 points per game. Offense won out this time, as Syracuse failed to defend the 3-point line. The Wolfpack shot 10-for-23 from behind the arc for the game and 7-for-13 in the second half. That was especially the case with the game tied at 70 after Oshae Brissett’s 3-pointer with a minute to go. After an NC State timeout, Markell Johnson sank a go-ahead 3 and Brissett missed a potential tying shot on the next possession. The Wolfpack shot 55.1 percent overall from the field. Syracuse was forced to utilize an atypical, smaller lineup, as centers Paschal Chukwu and Bourama Sidibe were limited with injuries. Marek Dolezaj played significant minutes at center. The Wolfpack also made a key adjustment, overloading one side of the court to open up more looks from downtown against SU’s 2-3 zone. It worked, as Sam Hunt came off the bench to shoot 4 of 6 from beyond the arc. To adjust to overloading, Howard attributed to his teammates’ length and athleticism as well as locating shooters better.